Sounds scary, doesn’t it? So when investors hear that the stock market just triggered the so-called "Death Cross”, they panic and do the absolute worst thing. The Death Cross is a technical indicator. You see it when a short-term moving average dips below a long-term moving average overlaid on a price chart. Typically, the moving averages used in this pattern are the simple 50-day (short-term) and 200-day (long-term) moving averages. As conventional wisdom has it, the Death Cross is a signal to bail on stocks and rush to safety. Since 2007, the Death Cross has emerged six times in the S&P 500. Of those six occasions, four would have crushed you had you acted on the signal and sold out of stocks. Is the Death Cross Really a Bull Dressed as a Bear? The first Death Cross in 2007 appeared on December 24th. You might recall that the stock market peaked in October 2007, before plunging into one of the worst bear markets since the Great Depression. That Death Cross signal turned out to be valid. Investors were able to bail in time to avoid one of the worst selloffs in history. 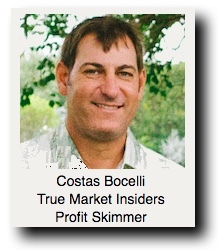 The market finally bottomed in March 2009. But that selloff was painful, and burned deep into the psyche. So much so that, every Death Cross since December 2007 has turned into a capitulation event. Each time the Death Cross signal was triggered, it did so at (or very near) a major bottom. In other words, the Death Cross was not a bearish signal at all, because most of the damage had already been done. In fact, the Death Cross has served as a reliable bullish signal for investors willing to step in (and step up) when others were quaking in their boots. 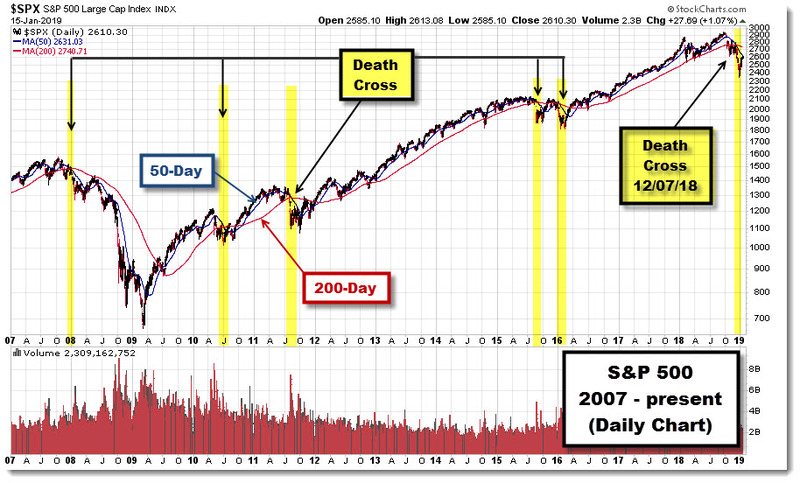 The next post-2007 Death Cross occurred on July 2, 2010, which turned out to be the absolute low. The S&P 500 went on to gain 33% by May 2011. The next one appeared on August 10, 2011. Although the market remained volatile for several months, on "The Day of the Death Cross", the S&P 500 closed at 1,120, less than 1% from the low during that selloff. Four years passed before the Death Cross next reared its ugly head. It happened on August 27th, 2015 around the time the United Kingdom voted to leave the European Union (the still-controversial "Brexit"). And guess what? 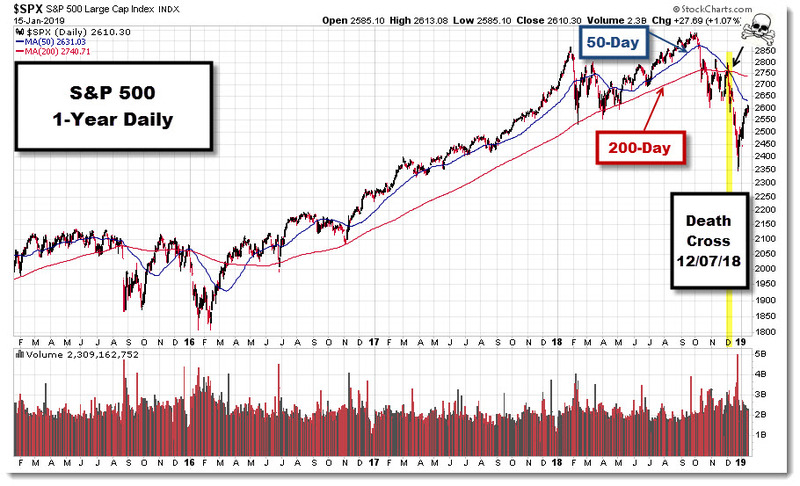 The 50-day MA crossed below the 200-day MA within a day or so of the low in the S&P. The index went on to gain 13% by November 2015. But it didn’t take very long for the fifth Death Cross to emerge. On January 11th, 2016 the S&P 500 closed at 1,923. The low was actually put in exactly one month later, on February 11th with the index trading down by less than 5%. But that too was a volatile period; trying to time the bottom was a tricky endeavor. But although the index moved a bit lower after the Death Cross appeared, it turned out to be a fantastic buying opportunity, as the S&P 500 gained 49% from that day to January 2018. This brings us to the sixth Death Cross, which was triggered on December 7th, 2018. December was a terrible month for investors -- the worst December for stocks since 1931. Investor sentiment was extremely pessimistic, and more than half of retail investors held a bearish outlook for the stock market. On December 24th, the market sold off another 2%. The S&P fell to 2,351, the worst Christmas Eve loss ever. This also came within a couple of weeks of the dreaded Death Cross. While most investors were panic selling after the Death Cross showed up, they should have been buying high-quality stocks at discounted prices. Do you think the esteemed Mr. Buffett would fear this latest Death Cross?